He describes his ministry as 'street evangelism', and he can often be seen in midtown Manhattan and Washington DC protesting US hostility towards Russia. He has a highly successful YouTube channel with over 35 million views and 130,000 subscribers, and maintains a website called RealJewNews. A spiritual imperative runs through Alexander Solzhenitsyn’s works. A proponent of Russia’s special mission in the world, Solzhenitsyn often expressed how the Jews have negatively impacted Russia’s destiny. — “The faith of our Church is the foundation and support of one’s life. And don’t forget what a horrible human toll the Russian Orthodox Church suffered throughout almost the entire 20th century. The Church is just rising from its knees.” — Here. This suffering of the Russian Orthodox Church is one of the topics Solzhenitsyn discusses in his magnum opus, “Two Hundred Years Together.” Labelled by Jews as “Anti Semitic” and banned from publication in English by the Simon Wiesenthal Centre, (that wicked enemy of free speech), the book charges Bolshevik Jews with the guilt of the Church’s suffering in the 20th century. — “Russian nationality is not about blood but about spirit. The greatness of our people is to be sought in its inner development, in its breadth of soul. The Russian spirit and Russian culture have existed for centuries. All those who feel themselves part of this heritage in spirit are true Russians” — Available Here. Jews do not feel themselves part of Russia’s “heritage in spirit” which is Christian and to them, and “Anti Semitic.” But in the current battle between the synagogue and the Church, (at least in Russia — not in the Jewish occupied West), the Church is winning. 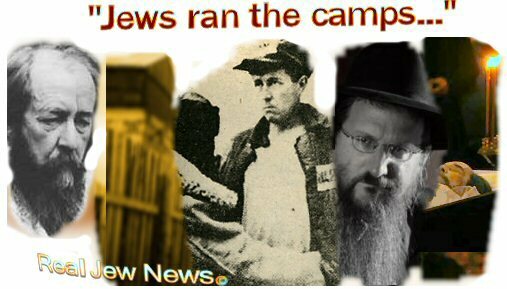 SPEAKING FROM FIRST HAND EXPERIENCE, Solzhenitsyn gave a candid account of Jews in charge of the Soviet prison camps in his book, Two Hundred Years Together. According to his observations, Jews made up a clear preponderance in the Gulag administration.